NovelStyle: Dress for the job you want! You all know that saying, "Dress for the job you want, not the one you have". I was playing with that idea while I was planning these outfits. I mean, the job I want, should allow me to get designer handbags! And, of course, I would buy most of my things in Cruise Fashion! Even though I'm a fashion designer, sometimes is good to have a personal stylist on hand. This is for those days when a dress is the perfect choice. -A gorgeous Alexander McQueen dress (a girl can dream, right?). -A Chloé phone case would be indispensable, mostly if it has a bow on it! You know how I am with them... gotta love them everywhere!. - Amanda Wakeley's jackets? There is a reason why they are in both outfits, they are beautiful and super dressy! - A braided paralux necklace. Love it! - And, obviously, Saint Laurent accessories! Designer shoes would also be a must! This outfit is for those "I'm wearing the pants!" kind of days. - A Gucci blouse, of course! With a flowery print that makes the pants look a little bit more girly. - D&G flats... one has to look good, but be comfy too ^^. - A huge statement bracelet from Kenneth Jay Lane. - And last, but not least!, one of my dream bags... aren't all Chloé bags dream bags? Now that I have my outfits figured out, the biggest question is... where is this dream job?! y los dos outfits son hermosos! I adore outfit #2! I'm looking for a new job and I'm definitely going to take this and used as my inspiration. I love the first set. 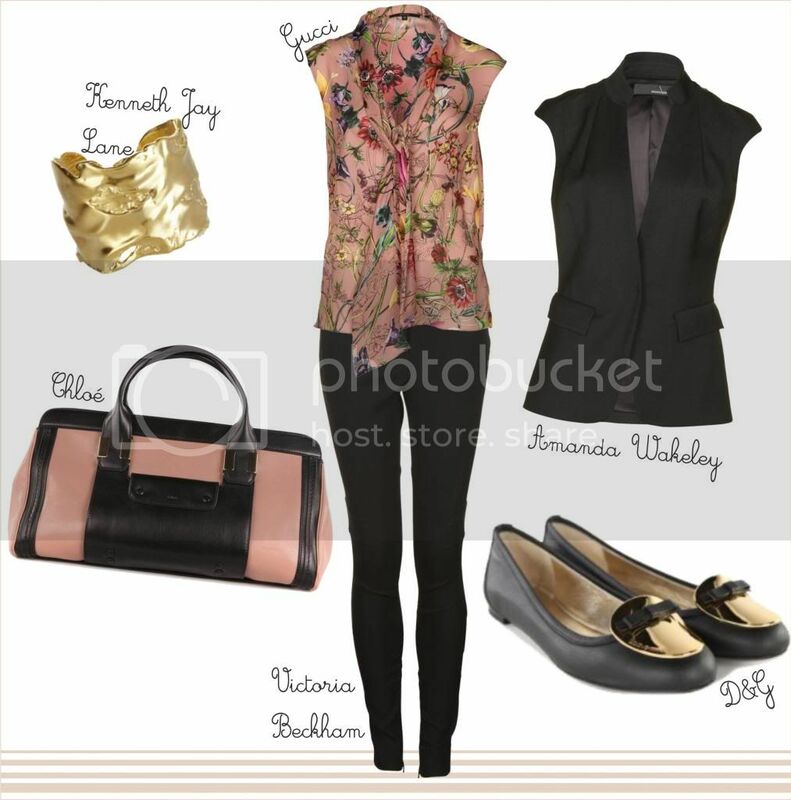 Smart casual with a twist of pink. Lovely post! I love both these outfits Ileana!!! Have a great end of the week my beautiful friend!!! Fantastic!! love the first outfit! I love the heels in #1! Love your fantastic styling, the first look is so classy, thats a gorgeous dress and I like the more casual side of the second outfit. P.S. Thanks for checking out my contact lenses review! I totally love the first set ! these sets are so elegant, love them.Would totally wear them! I really like the second outfit but I like the dress a lot in the first outfit. I would wear the second outfit to get the job I want - literally!